I wove a winter kerchief for my husband. Together we looked at many different types of yarns and patterns and finally decided on using Malabrigo Rios a superwash merino yarn. This Malabrigo yarn was so neat to work with that we decided to make a little video to share our excitement about this new yarn we found. Let us know what you think of the video and if you want to see more videos like this. Here are a few photos of how my husband plans to wear his kerchief while snowboarding. Hello! Hello! In this short video I am going to talk about and review a new yarn that I discovered, Malabrigo’s superwash merino yarn, Rios. 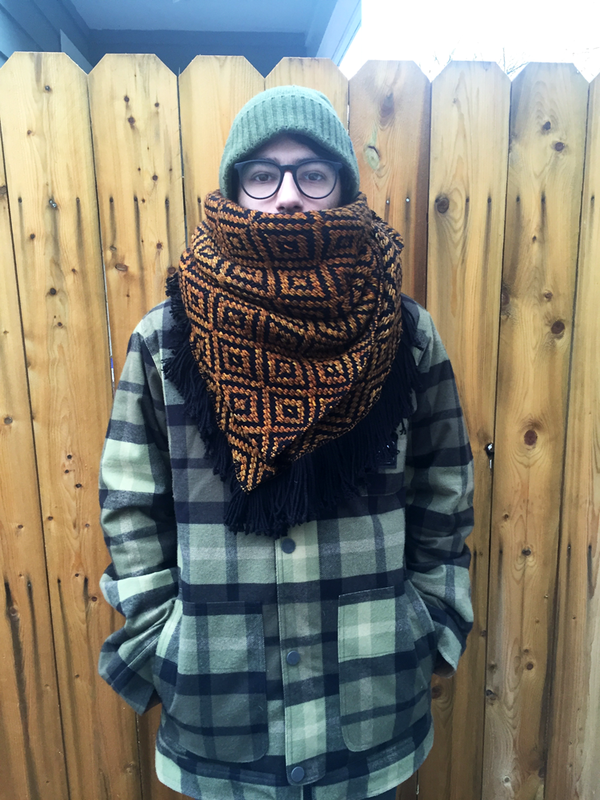 I tested this yarn out by weaving a kerchief for my husband, and we were not disappointed. So let me just tell you a little bit of the back story on this cool yarn company. Malabrigo is a family owned company based in Uruguay that has created 17 lines of yarn in over 300 hand-dyed color-ways. The company employs mostly women, trying to provide job opportunities for those who are less likely to find work. Malabrigo also employs environmentally safe practices trying to use as little water and as few chemicals as possible. All of this is just icing on the cake of this delicious yarn. I wanted to try it because of its superwash quality and rich color options. The end result of the original project was to create a kerchief that my husband could wear snowboarding and not have it be completely felted on him by the end of the season. I wove this kerchief with a solid black for the warp and the glitter color-way for the weft. It was so much fun to weave with! I used an advancing twill goose-eye to really showcase the glitter color which is really neat, it actually transitions from yellows to ochres creating an additional level of depth to the final fabric. This yarns’ thick and squishy nature also makes it really satisfying to see it being created on the loom. This is the final product measuring around 35 by 35 inches. The final kerchief is thick, squishy, and unbelievably warm. Because this yarn does have a fair amount of stretch, I wove this piece fairly loose expecting some shrinkage when it came off the loom and it was wet finished. I was right. The width of the kerchief shrunk 31% and the length shrunk 11%. However, after I wet finished it, it fulled up and came together really nicely. After some testing we have concluded that it is great at blocking out the wind while keeping your warmth in. Its one of those pieces that after you wear it for a while and you take it off, your body misses the heat that it trapped. 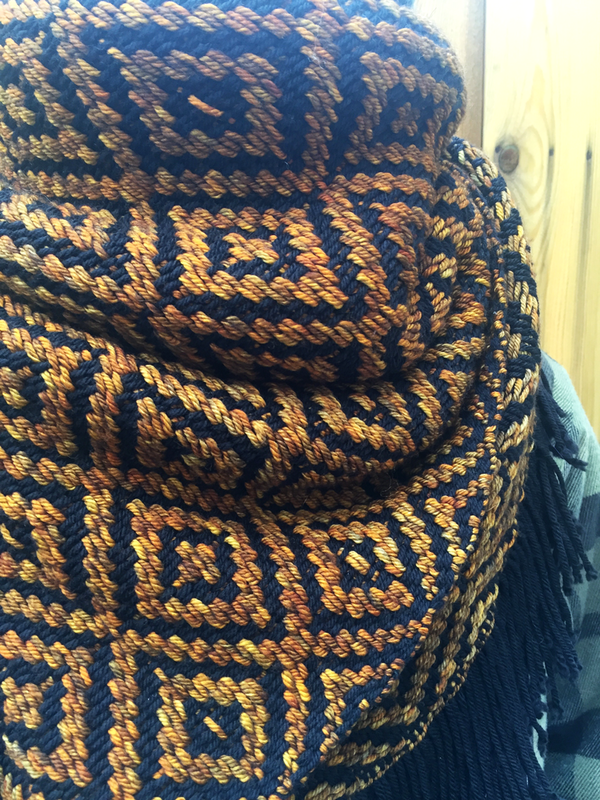 The Rios yarn was really great weave with, it created an amazingly dynamic and beautiful fabric with a great drape. 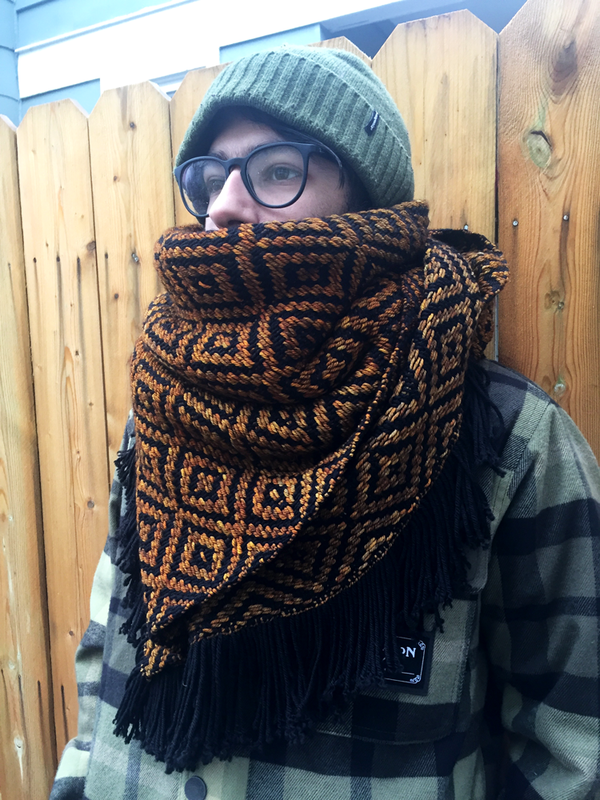 Its so amazing in fact that I am currently creating a production run of these so that you can purchase your own kerchief for the winter season and soon we will be carrying a variety of Malabrigo yarn so that you can create your own unique piece. I am a newbie weaver (although I’ve been spinning for a while). I want to use the hand-spun that I make and for one of my projects I planned on using some of the hand spun along with a commercial knitting yarn for the warp (my hand spun is not up to WARPing). My weaving instructor was adamant that I would have problems using knitting yarn for a warp. I can imagine how that might occur, so I’ve followed her advice for the current project, BUT….. I was wondering if you had any advice on using knitting yarn for a warp (specifically I don’t want to use a rigid heddle). Your work with the Malabrigo looks awesome (it’s my significant others favorite yarn). Many weavers have expressed that it is not a good idea to use knitting yarn in the warp. It is only because a lot of knitting yarn has a lot of loft to them and can be extra stretchy when you put it on the loom. As long as you are prepared for it- it isn’t that difficult to use! As you are winding the yarn for warp, put a fair amount of tension on it. Knitting yarn most likely will stretch, so if it is wound in its’ relaxed state and put on the loom in a tensioned state, your calculations will be distorted. Once you remove your weaving from the loom, expect more shrinkage than you calculated. The warp will return to its’ relaxed state, which means that it might cause your warp length in your project to cinch up. Always sample. I can’t stress this enough. This will help you determine the right sett for your yarn, the best way to wash it afterwards, and how much shrinkage you will expect in the final project. One of my instructors explained to me her method of sample. She sets up her loom with the project, with a little bit extra in the beginning. Weave a good chunk (I usually go 10″) and then cut it off. If you can, cut this into three pieces. One you will not wash- it is just how it is off the loom. The second you will hand wash gently. The third you will put through the wringer- toss it in with your laundry, washer and dryer both. This way you can see how far your fabric can be pushed. Take careful notes of before washing and after washing shrinkage. Also, note what the dimensions are on the loom before you cut it off. This will give you a great insight on how the material will react. If the yarn can fit through the heddles, doesn’t tear apart in the reed, and can withstand some tension- you can use it for warp. Make sure you will have a nice clean shed and you are good to go. I hope that helps. And I love the idea of incorporating handspun yarn with commercial yarn. Gives life to the commercial yarn, and it helps to showcase the specialness of the handspun! If you have any other questions, feel free to ask.